Juliet Stuart Points' photograph from the 1907 Mortarboard. Image courtesy of the Barnard College Archives. 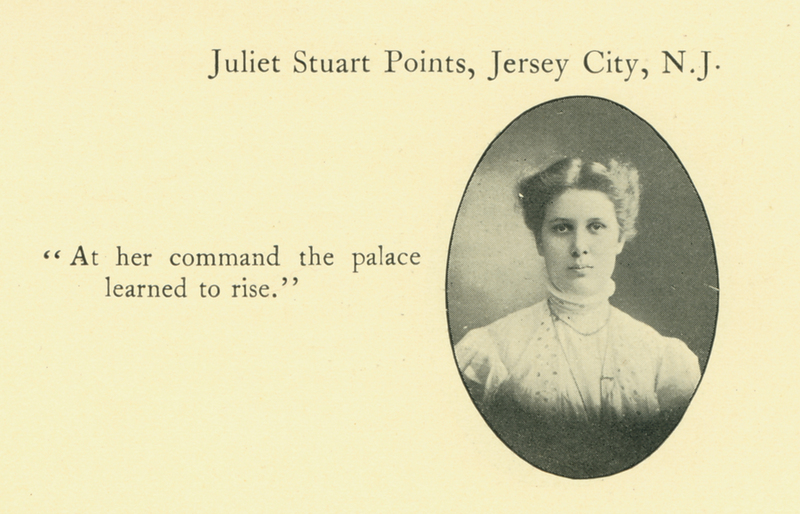 On an early June day in 1937, Juliet Stuart Poyntz—Barnard class of 1907, known for her intellect, poise, and charisma—walked out of her rented room at the American Woman’s Association clubhouse and was never seen again. Her attorney reported her disappearance seven months later, launching Poyntz to a different kind of recognition than the intellectual was used to: notoriety. Newspaper headlines traded allegations: Poyntz was a Russian spy–she had been recalled to Russia–she was murdered by the OGPU (the Soviet secret police and the predecessor to the KGB)–she had turned against her communist ties and was placed in the Witness Protection Program. Who was Poyntz, and what happened to her? Born Juliet Stuart Points on November 25th, 1886 in Omaha, Nebraska, Poyntz moved to New York City with her family at some point during her adolescence, and enrolled at Barnard College in 1903 as a 16 year old. Precocious and intelligent, Poyntz was extremely invested in Barnard as an institution and supplemented her coursework with leadership roles in extracurriculars. She was a member of the Pi Beta Phi Fraternity for women and of the Christian Association, President of her sophomore class, and President of the Undergraduate Association in her senior year. The scrapbook of her close friend, Sophie Parsons Woodman (also class of 1907) contains a letter from her about the proposed creation of a “senior society,” in which she worried over the possibility of creating divisions within her class. She also participated in the 1907 senior show and worked on the Board of Editors for the 1907 Mortarboard. Poyntz was voted “most popular” in her class and in the college, spoke as valedictorian for her graduating class, and went on to work as an instructor in the Barnard history department. 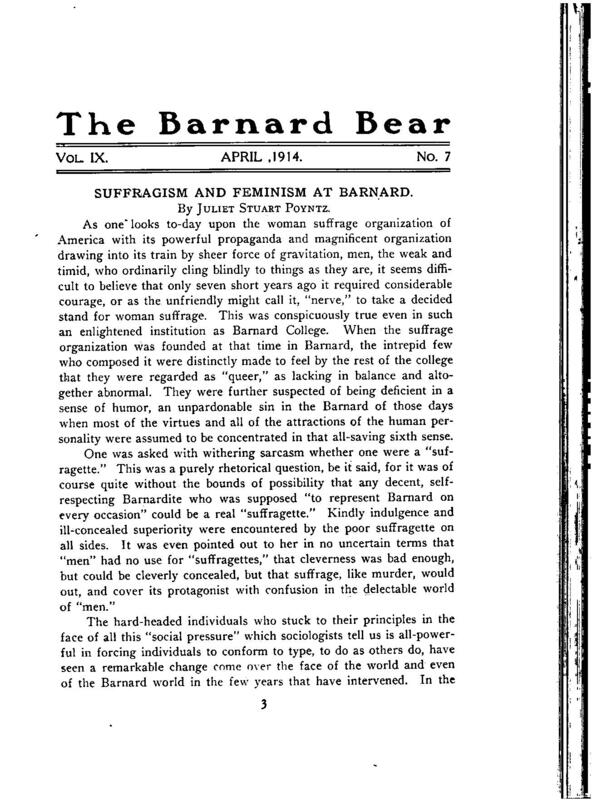 Page one of an article on feminism written for "The Barnard Bear" by Juliet Stuart Poyntz during her time as an instructor at Barnard. Image Courtesy of the Barnard College Archives. During her years at Barnard and after her graduation, Poyntz was involved with the suffragette/feminist movement, which was gaining momentum during the early 20th century. In 1912, she gave an address to the Suffrage Club at Barnard, quoting freely from John Stuart Mill and calling for women to assert their individual freedoms. Ironically, referencing one of the fathers of laissez-faire economic policy was in direct opposition to her other great cause: socialism. Poyntz viewed the principles of equality touted in socialism as a natural extension of the women’s movement. In the 1912 Barnard Classbook, Poyntz reports having worked as a Special Agent for the U.S. Immigration Commission shortly after graduation, where she “found [her] proper level in the slums with the lowest of low delightful immigrants” and claims she is “still a woman’s suffragist or worse still a feminist and also a socialist (also of the worst brand).” In 1913, she married Dr. Frederick Franz Ludwig Glaser, a German immigrant. Though she kept her maiden name after the marriage, she legally changed the American spelling of her last name, “Points,” to an Eastern-European phonetic version, “Poyntz.” Though her reasons for doing this are unknown, it is around this time that Poyntz actively became involved in the Communist Party. Poyntz rose to visibility as an activist for both the suffragette movement and the communist party in the years that followed her marriage. She published articles in the Nation about the economic future of various forms of government, and was one of the headlining speakers at Woman’s Day on April 31st, 1915–a historic event crucial in the women’s suffrage movement and associated with both the socialist and communist causes–where she was billed as a “Feminist Communist.” By 1920, Poyntz was “high in the circles of communists.” In 1934, disillusioned by the apparent inaction of the Communist Party in America, Poyntz withdrew her communist sympathies and visited Russia, where she became an agent for the OGPU. In 1936, Poyntz, disgusted by the brutality of the organization and the realities of the communist Gulag, withdrew from the OGPU. According to an article written by her close friend Carlo Tresca (labor organizer and opponent of Stalin) in which he accused the Soviet Union of murdering her, she began to unleash violent tirades against the self-serving and tyrannical activities in Soviet government to her personal friends. Less than a year later, she vanished. Given her unpatriotic activities towards the end of her life, it is understandable that Poyntz is not listed as a notable alumna on any of the brochures that Barnard gives prospective students. However, throughout her life of activism, Poyntz worked to maintain her personal integrity and beliefs in the cause of social de-stratification even while she was being dragged progressively deeper into the activities of a dangerous organization. She is an unlikely but excellent example of the dauntless, committed spirit that Barnard prizes in its students. Tresca’s accusations can be read here, in an article entitled “Where is Juliet Stuart Poyntz?” written in 1938, just five years before he was murdered by Mafia gunmen for his anti-facist sentiments. Dorothy Gallagher’s “Disappeared,” a dramatic essay on the Poyntz abduction (in which Gallagher accuses Poyntz of abducting another OGPU spy to the Soviet Union in 1936, before her break with the organization) that claims to draw information from Poyntz’ FBI file, can be read here.